There is often confusion on the world of publishing. At times you get conflicting information. Is it better to self-publish or to do the work to go with a traditional publisher? Do you need a literary agent? How do you find a good one? Sometimes you read about agents who do nothing or are crooks (yes they are out there). You read some websites and that information conflicts with what you hear from published authors or in writing books. Where do you get an experienced answer to your hard publishing questions? When I face these types of questions, I turn to an expert. Yet how do you even reach an expert and especially if you don't know many people in publishing? Tuesday, March 1st, I'm interviewing Rick Frishman who is in his 39th year in publishing. For many years, Rick ran one of the largest public relations firms in the United States—Planned Television Arts in New York City (now called Media Connect). For almost ten years, Rick has been the publisher at Morgan James Publishing. He has guided many authors to become bestsellers and knows this industry inside and out. Here's your opportunity: I've convinced Rick Frishman to go on the hotseat for my questions during a LIVE 70-minute telewebcast on Tuesday, March 1st! 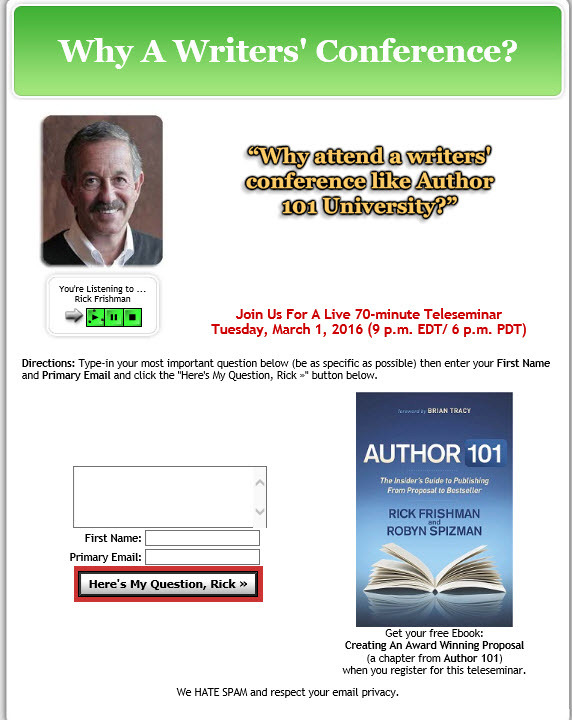 Rather than have the "content" come out of Rick's head (or my head) for the March 1, 2016 telewebcast at 6 p.m. PST / 9:00 p.m. EST, I decided to let you ask Rick a question. Here's your chance to ask Rick directly and get registered for our call on Tuesday, March 1, 2016 (starts promptly according to www.Time.gov). After your question gets submitted, you'll find out how to get phone access and webcast access to Rick and myself for our LIVE telewebcast, March 1, 2016. If your schedule doesn't allow you to attend this LIVE event, I encourage you to go ahead and register—and ask your question. The event will be recorded and everyone who registers for the event will receive the replay recording. Rick is one of the most experienced people in publishing that I know. I hope you will bring on your hard questions about various aspects of the publishing business. I will be reading these questions and then asking Rick on Tuesday. I hope to speak to you soon on the call.